Nikon AS/AE Series auto levels feature waterproof, nitrogen-filled, high-power telescopes that help you make precise measurements even in the wettest conditions. They feature a unique automatic air-dampened compensator to prevent magnetic interference, and an endless horizontal fine drive to ensure smooth, precise pointing and angular measurement. AS/AE Series auto levels are easy to set up and easy to use. This comes in four models. The AS-2 and AS-2C feature a 30x telescope while the AE-7 and AE-7C feature a 32x telescope. The AS-2C and AE-7C are capable of making convenient horizontal angle measurements. 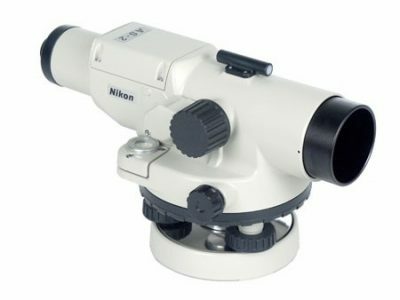 All four models can attach to both flat and spherical-head tripods, and the standard optical sight lens helps you find your target quickly, easily and accurately. A mirror with a pentaprism lets you view the circular bubble as an erect image during setup and sighting. Carrying case, adjusting pins and lens cap included.